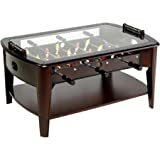 When you combine the fun of a foosball table with the usefulness of a coffee table, you get the cool new Foosball Coffee Table. This unique table is constructed from solid hardwood with elegant accents and hand-carved detailing and has a furniture-grade play field on top beneath a glass top. 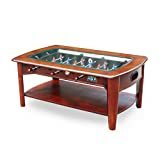 It features a red and blue team of hand painted foosball men, each controlled from each side by 3 separate wooden handles, wood scorekeeping beads on each end, a functional shelf below, and stainless steel ball returns. The best part is that you have a place to put your drink down while you play, but clear off all those coffee table books and magazines you never read first.